Explanation: Why would clouds appear to be different colours? The reason here is that ice crystals in distant cirrus clouds are acting like little floating prisms. Sometimes known as a fire rainbow for its flame-like appearance, a circumhorizon arc lies parallel to the horizon. 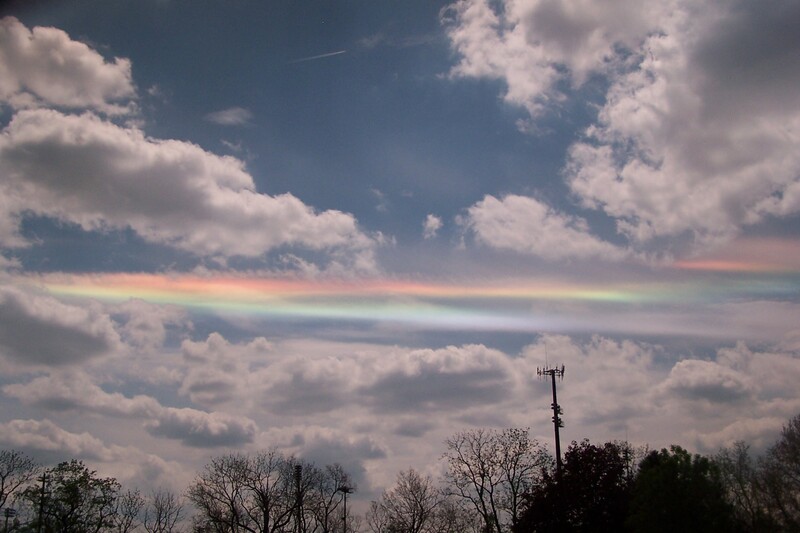 For a circumhorizontal arc to be visible, the Sun must be at least 58 degrees high in a sky where cirrus clouds are present. Furthermore, the numerous, flat, hexagonal ice-crystals that compose the cirrus cloud must be aligned horizontally to properly refract sunlight in a collectively similar manner. Therefore, circumhorizontal arcs are quite unusual to see. This circumhorizon display was photographed through a polarized lens above Dublin, Ohio last week. Apologies: Earlier, APOD misidentified this phenomenon as iridescence.